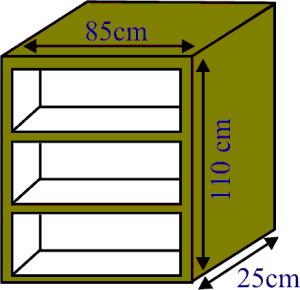 Q.1 A wooden bookshelf has external dimensions as follows : Height = 110 cm , Depth = 25 cm, Breadth = 85 cm (see figure). The thickness of the plank is 5 cm everywhere. The external faces are to be polished and the inner faces are to be painted . If the rate of polishing is 20 paise per and the rate of painting is 10 paise per , find the total expenses required for polishing and painting the surface of the bookshelf. 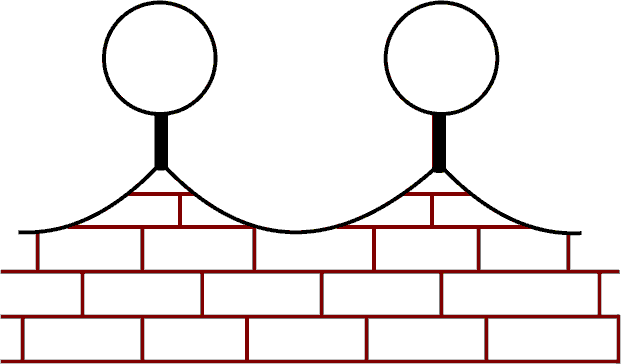 Q.2 The front compound wall of a house is decorated by wooden spheres of diameter 21 cm, placed on small supports as shown in figure. Eight such spheres are used for this purpose, and are to be painted silver. Each support is a cylinder of radius 1.5 cm and height 7 cm and is to be painted black. Find the cost of paint required if silver paint costs 25 paise per and black paint costs 5 paise per . Clearly, we have to subtract the part of the sphere that is resting on the sphere while calculating the cost of silver paint. Surface area to be silver painted = 8 (Curved surface area of the sphere - area of circle on which sphere is resting). 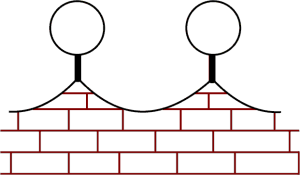 Surface area to be black painted = 8 × curved area of cylinder. 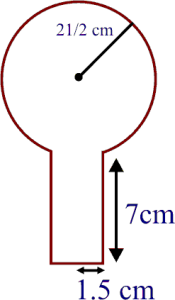 Q.3 The diameter of a sphere is decreased by 25%, By what percent does its curved surface area decrease? Let d be the diameter of the sphere . Then it's surface area.